current bulletin for this week's Mass times. When people move into a community they often worship at several churches in the area before actually joining one. I’m very pleased to say that folks become members of Saint Mary’s because of our family atmosphere and celebration of Sunday Eucharist. Our parish has been serving Catholic families in the Solon area since 1853 when Father M. Hammon, an Irish-born priest, celebrated Mass with four families in a Solon home. Saint Mary’s parish family is now over 600 families. We strive to serve the spiritual needs of your family through ministries of Word, Worship and Service. Our vision is “to create and maintain a Christ-centered Catholic community where our personal call to holiness, service and spiritual growth leads to continued authentic witness as Christians.” Enjoy browsing through our website to learn more about Saint Mary’s. We look forward to meeting and worshiping with you at Sunday Mass! Second, current trends in both government and culture are moving toward redefining marriage as the union of any two persons, ignoring marriage's fundamental meaning and purpose as the universal institution that unites a man and a woman with each other and with children born from that union. 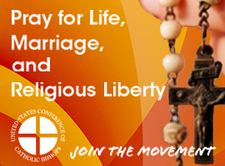 For our parish and our country, that we will become more aware of the dignity of the human life from conception to natural death, the beauty of God’s plan for marriage, and the significance of full and authentic religious liberty. Confession and through the Project Rachel Ministry. For those in the twilight of their lives, that their families and caregivers will cherish them and care for them with tender compassion, rejecting the path to assisted suicide. For married couples, that they continue to live their vocation of love as an example to their families and to the world of God’s faithful, fruitful, and lasting love. For all those suffering from troubled or broken marriages, especially children, that they will be assured of God the Father’s unfailing care for them. For all those discerning a vocation to the priesthood, consecrated life, or marriage, that the Lord guide their hearts and make His will clear for their lives. For our President, Governor, legislators, judges, and all in service to the common good, that through the gift of heavenly wisdom they may work to uphold religious freedom and conscience protection for all.